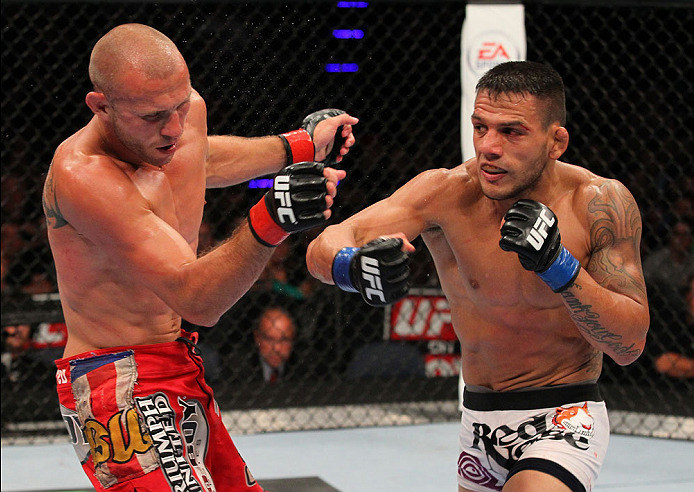 Rafael Dos Anjos won 14 bouts in the UFC lightweight division. In the spring of 2015, he ascended to the top of the deepest weight class in the promotion, delivering a master class in pressure and game planning to dethrone Anthony Pettis and end “The Showtime Era” before it had a chance to even get started. Nine months later, he stepped into the Octagon and halted Donald Cerrone’s two-year, eight-fight run of success in a heartbeat to solidify his place as the best lightweight in the world. Yet despite all of his previous success, the 33-year-old Brazilian believes he’s reached a new level since shifting to the welterweight division. Following his win over Cerrone to close out the UFC’s 2015 campaign, Dos Anjos faltered, dropping the lightweight title to Eddie Alvarez before coming out on the wrong side of a one-sided decision against Tony Ferguson. It was just the second time in his career he’d dropped back-to-back contests and it signaled to the talented veteran that it was time for a change. While lightweight is universally regarded as the deepest collection of talent on the UFC roster, the welterweight division is flush with talent as well, leading many to wonder how the former lightweight champion would do in his transition to the 170-pound ranks. After debuting with a grinding decision win over former Strikeforce champ Tarec Saffiedine, Dos Anjos delivered an impressive Canadian double in 2017, quickly submitting perennial contender Neil Magny at UFC 215 in Edmonton before shutting out former champ Robbie Lawler over five rounds in Winnipeg. “Since my first fight with Tarec, I think I was able to take improvements into the fight with Neil and then with Robbie,” said the talented southpaw, who will be making his 25th appearance in the Octagon this weekend in Chicago. “I feel like I’ve been improving every time and I’ve been able to improve my game, to adapt to the new division. From the time he decided to relocate to the welterweight division, Dos Anjos has been laser focused on joining Randy Couture, BJ Penn, Conor McGregor and Georges St-Pierre as the only fighters to capture UFC titles in two different divisions. He gets that opportunity this weekend when he clashes with Covington in the co-main event of the evening. 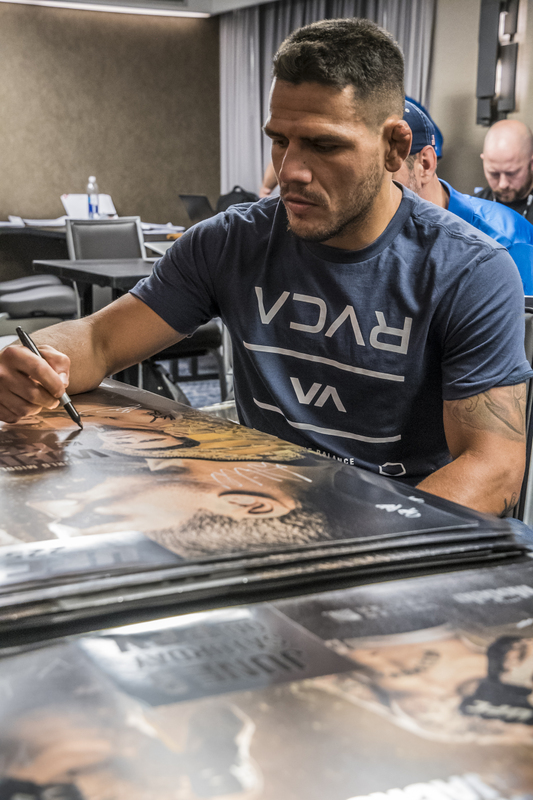 “It means a lot for my legacy,” admitted Dos Anjos. “I’ve been in the UFC for 10 years this year – it’s been a long journey, a lot of fights. I became the first Brazilian lightweight champion and now, I’m on my way to become the welterweight champ as well. In a strictly competitive sense, the pairing with Covington is an interesting clash of styles, as the tenacious American Top Team representative brings a pressure style forged on the wrestling mats into the cage with him every time. Over the last two years, “Chaos” has collected five consecutive victories, grinding out wins over Max Griffin, Dong Hyun Kim and Demian Maia to climb towards the summit of the welterweight ranks. But it has been Covington’s unrelenting social media onslaught and incendiary post-fight performances that have ratcheted up the anticipation surrounding this fight. Eight months into his constant barrage of Twitter insults and heel promos, fans and observers are eagerly awaiting this showdown, hungry to see if the proud Brazilian Dos Anjos will make the boisterous American pay for the things he has said. While he’s fully aware of Covington’s various comments, the surging former lightweight champion is far more focused on what his opponent brings to the cage and exploiting some of the advantages he carries with him into this contest. “I know he’s going to come strong – he’s a big guy and he’s a wrestler, so he’s going to try to take me down, stay on top; that’s his game,” he said of Covington. “But I’ve been improving a lot, including my wrestling skills. “It will be his first five-round fight and I think he’ll have a hard time to last five rounds with me. I’m in great shape, feeling at my best and I think that’s an advantage for me. It will be my 38th fight – I’ve been in this game so long – and I know what it’s like to be in a five-round fight and I think my experience will be a big factor. “I think people do whatever they choose to promote themselves and he chose that way, talking about somebody else’s country to promote his fight and promote himself,” he added in regards to Covington’s various comments. “I don’t think it’s the right way, but I don’t have any extra pressure (to silence him for Brazil). And with the interim welterweight title in his sights and a potential title unification bout on the horizon later this year, claiming UFC gold for a second time and delivering another cold-blooded performance inside the cage is exactly what Dos Anjos intends to do this weekend. “I think I will finish him before the fifth round,” he said with confidence. “It’s a matter of time. It’ll be a couple rounds for me to figure out his game, start finding holes in his game and make him quit, start breaking him little by little.